First Focus has released nationwide polling data confirming strong support for children’s health coverage legislation among Republican voters. 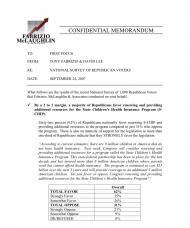 The poll, conducted by Republican polling firm Fabrizio McLaughlin & Associates, found that by 62-31% — a 2-to-1 margin of support — Republican voters support Congressional passage of a bill that would extend and strengthen the popular State Children’s Health Insurance Program (SCHIP). In addition, the poll found that by a 4-to-3 margin Republican voters are less likely to vote to reelect their Members of Congress if they oppose the legislation.